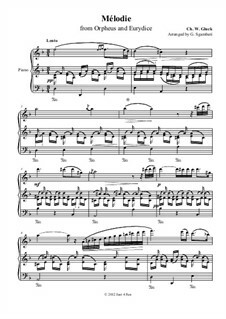 A famous Melody from Orfeo ed Euridice arranged for piano solo by Giovanni Sgambati. In my opinion, this is one of the most beautiful and sad melodies ever composed. 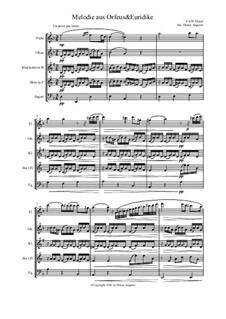 It is a challenge to play this version covered in a concert transcription with a necessary expression. 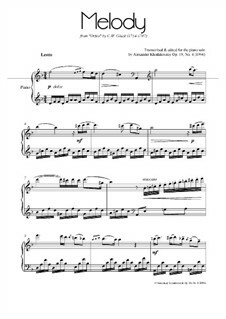 This piano sheet music is one of my favorite. Hope you'll enjoy playing it! Знаменитая "Мелодия" из оперы "Орфей" Х.В. Глюка в версии для скрипки (или флейты) в сопровождении струнного оркестра. 2 фл.2 гоб.2 клар.2 валт.фагот,контрабас. 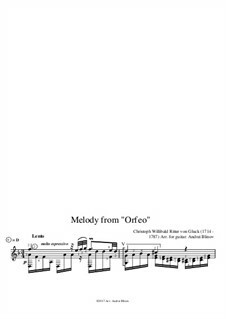 Melody is a beaгtiful piece from opera "Orfeus ed Euridice". Ein wunderbares Stück, das nach einem schönen Satz verlangte. Für Holzbläserquintett von mir eingerichtet. Viel Freude beim Anhören und Musizieren. 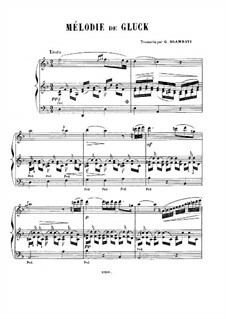 For piano Arranged by Sgambati G.
For piano, Op.19 No.4 Arranged by Khodakovsky A. 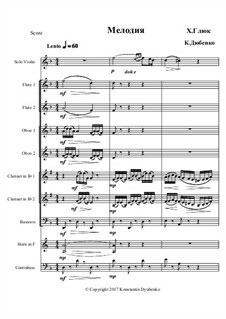 Arrangement for violin and string orchestra Arranged by Struck P.
For wind ensemble Arranged by Dyubenko K.
For guitar Arranged by Blinov A. 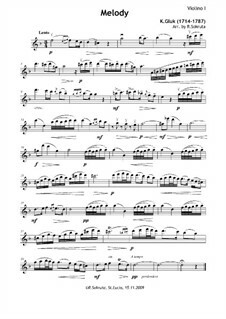 For wind ensemble Arranged by Angerer D.